Now that we have investigated Basic Mode, I thought it might be helpful to see how I setup a panto step by step. First, I measure the length and width of my quilt top. I do this even though it is already on my take-in form. I do most of my take-ins at a local quilt shop, and while I rarely make a mistake, it can be very confusing when they are busy; it is just safer to measure it again. Then I load the quilt onto the frame. When using Quilt Path I will typically do a full float load. Meaning that I pin top and bottom of the backing onto the take-up and backing roller leaders, respectively. But I don't pin the quilt top to a leader. Instead, I smooth the batting over the backing and then smooth the top over the batting. I use the channel locks on my longarm to make sure that the top edge of my top is straight and sew it down. Then because I have a vertical lock I use it to sew down the sides. This lets me get the top very square. The rest of the batting and the quilt top then hangs off the front of the machine. Now that the quilt is loaded, I use Quilt Path's ruler feature to measure from just right of the right side to just left of the left side of the quilt top. I click on the button that lets me use this measurement as the width. Since I have inspected the top, I know if it is square, if I need to, I may add a little to this measurement once I am in the Pantostacker. Measure the top using the Quilt Path Ruler. Enter the length of your quilt into Total Height. At first it is a good idea to add an inch to make sure that you will not run out of pattern before you get to the bottom of the quilt. As you use the software, you will start to learn how much you need to add or subtract from the length to get it to stop where you want it to. For instance, on my system, I actually put in a little less then my measurement and it still quilts off the bottom of the quilt. Change the Mode to Basic. Change Nest to Ends (the middle circle will be selected like in the picture) This connects the patterns and adds partials onto the ends if necessary. Take the check off of Fit. Select the Pattern you want to use. Increase the rows and patterns. I usually add enough rows to have about an 11 inch pattern height and the add patterns until the design looks correct. This really depends on the pattern you are using. 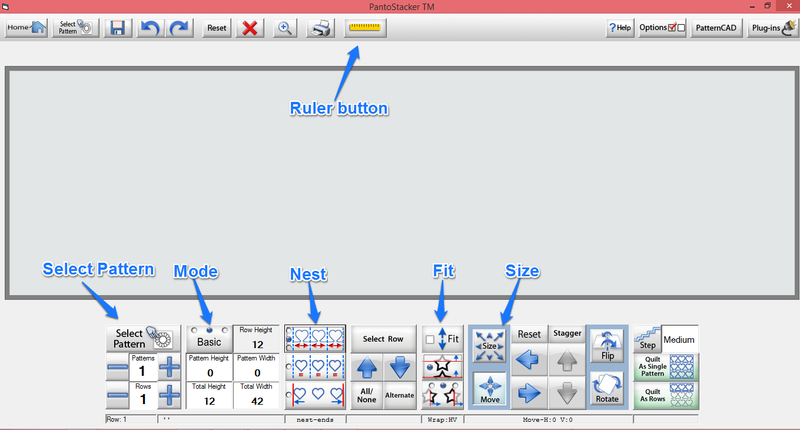 Resize the pattern to get the nesting to look correct. If your pattern is undulating this will also add the partial rows at the top and bottom of the quilt. Use the zoom feature to make sure you like the spacing between the rows. I tend to like mine to nest very closely together. This is very subjective. You want it to look right to your design eye. Select Quilt as Rows. If it is very large quilt, or very dense quilting it may take a couple minutes. Depending on how you went into Pantostacker, Quilt Path may ask you to set your safe area. You want to set an area that is outside of your quilt top but inside your clamps. Now I move my longarm to slightly to the left of and slightly above the right top corner of the quilt top. By slight I do about an 1/8th of an inch above and to the right of the top. I then choose the right align button with the flag on it. This tells Quilt Path this the Top Right corner of the top. If you have jump stitches, select the optimize button and remove the jump stitches. Click no when it ask you if you want to connect the first and last stitch. Select Trace and let it trace forward. This will show you where the design is starting on the left and if you need to you can let it trace far enough to check the top edge too. Once you are satisfied with where it is going to stitch, stop the trace. If you need to you can move where the top right corner is and do the trace again to check the right side. Now you are ready to stitch. You can either use the Pull Bobbin feature or you can have Quilt Path Move to Start and the manually pull the bobbin thread. Hold onto both threads and choose Sew. Remember, it will quilt the first almost full row and then go back and quilt the partial row at the very top. Then it will scroll to the 2nd row. This is always a little confusing at first, because it quilts, then goes up a row then quilts under the first row it quilted. There is also a blog post on how to change rows. The next Tech Sunday post will talk about actually quilting the pantograph. I want to take pictures of the process so that you can actually "see" me quilting a quilt and how I forward the quilt. At some point, I will start doing videos. I am posting this mid-week, because I missed last Sunday and the next Tech Sunday will post on April 20th.